What exactly is CyanogenMod? - Will this be the New Android Revolution? 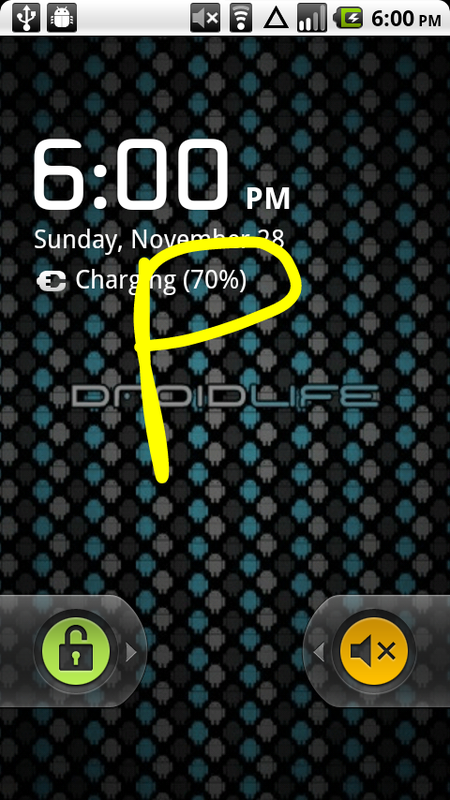 How many of you have an Android powered phone? If you don’t have one yet and are planning to buy one. . . WAIT!! Try and pick one from THESE devices. Why?? I have an Android powered phone and expect more out of it but only with the list of devices mentioned and a few others like the Amazon Kindle Fire, you’ll be able to update to the latest version of CyanogenMod. Though this isn’t an official release by Google itself, It has replaced the stock firmware in many devices. What Exactly is CyanogenMod ??? CyanogenMod is the true face of the Android OS unleashed. In a very broad sense, If Android is Windows Vista, CyanogenMod can be seen as Windows 7. Commercial versions of the mobile platform are customized by vendors like Samsung, T-Mobile, HTC, Motorola etc for their specific devices. Thanks to Google, the development of Android by many open source developers has led to the birth of CyanogenMod, which is named after the screen name of an early developer of the firmware. The stable CyanogenMod 6 was released late in August 2010 for devices running Android 2.2. As Google announced Android 2.3 codenamed Gingerbread ,a conglomerate of freelance developers and communities were quick to release an upgraded CyanogenMod 7. The latest stable version out is 7.1 as of 11th October 2011 for more than 60 smart phones and tablets. Stable releases which as the name suggest are tried and tested versions of the firmware. Release Candidates which are under test and development, slightly buggy and need to be improved. Nightlies which are crude and could cause fatal problems to your phone. In terms of performance, CyanogenMod is awesome. Awesome to the degree that it can push your phone to its limit. Be warned that some devices could act weird while running it but you’re guaranteed to love the upgrade. Once successfully installed, Your phone’s Settings menu will have a new link called CyanogenMod Settings which will unlock the gate to some stunning features on your device. So how different is CyanogenMod 7 from Android Gingerbread? I could go on and on and on about it. 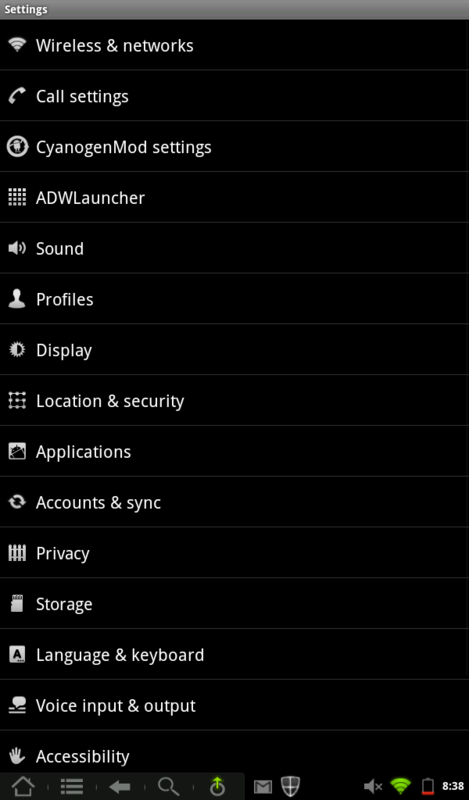 The user interface has been modified a lot and uses the ADW launcher, which has somehow disappointed many Android lovers. For detailed info on the complete list of Android launcher styles, Click Here . The default theme is very similar to that of the Google Nexus and several cool themes can be added via the android market. Scrolling feels like slicing butter with a Hattori Hanzo sword. The notification screen has been greatly improved by adding more controls and the ability to now deal with each notification individually. The status bar that is usually at the top of the screen can now be moved to the bottom. Most of these settings are common for smart phones and tablets but specific tablet settings can be found under tablet mode. Gesture recognition for Android is here!!! Just draw a gesture on your phone and see the action performed. 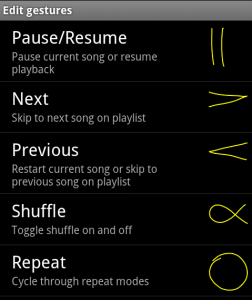 You could now play a song by drawing an arrow on the phone’s screen or stop it by drawing an ‘S’. All this even if your phone is locked. 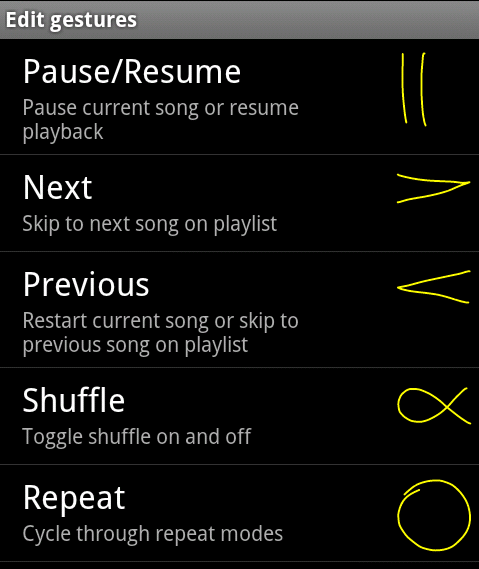 You get to customize gestures for various functions under the CyanogenMod Settings. The music player also comes with FLAC file support and the DSP Manager which has definitely improved the audio experience by adding an equalizer and a virtual room effect that was missing previously. You see those crosshairs when you try clicking a picture with your phone’s camera? I’m very sure you tried moving them to focus on a part while taking a picture and it doesn’t turn out to be what you expected. With CyanogenMod, touch to focus actually works but there are many reporting a buggy camera. The applications seems to be force closing on some devices. Songs can now be changed using the volume control buttons on the phone and you can alternately use the power button to click pictures. A Reboot option has been added to the power menu. You’ll notice all LED’s finally work on your phone which probably never did before. You can enable haptic and tactile feedback on the device which makes the experience more realistic and pleasing. 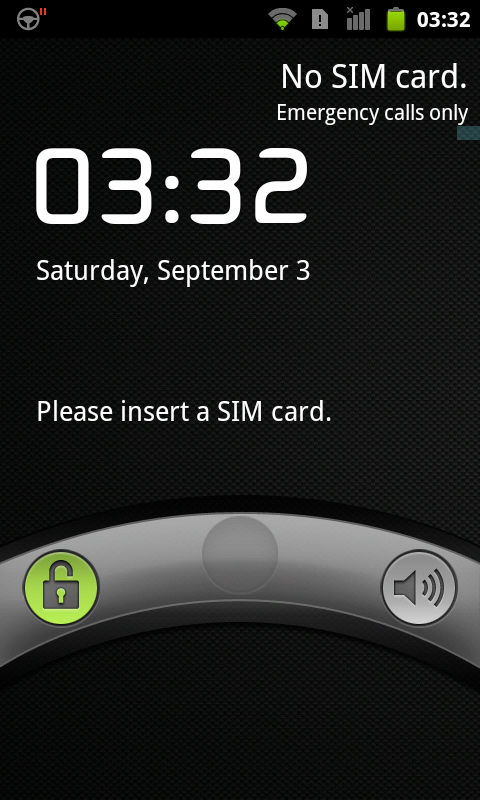 You can choose from a variety of ways to unlock your phone. It is also seen that wireless connectivity has improved. Android devices can now be tethered and used as network hotspots via USB, Wi-Fi or Bluetooth. There’s also an in built OpenVPN client available for secure point to point connections. Earlier, to manage CPU performance, you had to use a 3rd party tools like setCPU but now, over clocking your device is a built in feature that you can control which is totally awesome. 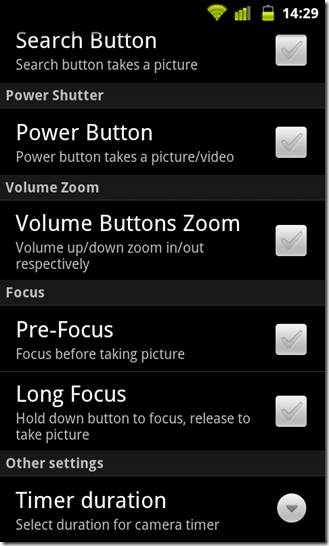 It does contain some advanced settings most novices would consider avoiding. Many of the apps you download and use require access to various data and services on your phone. Some of the services that are accessed may seem unnecessary for example I downloaded this set of HD wallpapers which uses my network service, the SD card and phone contacts. WHY IN THE WORLD would a wallpaper app need to access phones contacts?? You can alter permissions for applications running on your device using the permission manager. Be careful about messing with this as well because a wrong move could end up applications to stop functioning properly. You can now set your apps to install directly to your external memory card(actually you don’t because this is set by default) rather than letting them use the phone/internal memory. This can be done by selecting your device Settings >>CyanogenMod Settings >> Application Settings >> Install location and then selecting either Internal, External or Automatic, which means the system will decide where to install the app. With CyanogenMod downloads hitting the 1 million mark recently, a big majority of the users have reported an increase in the battery life of their smart phone, in spite of the boost in performance, and features. Others complain that power consumption hasn’t changed or has decreased, something that will have to be looked into for future releases Talking about battery life, the upgrade now lets you view the power level of your phone in terms of percentage remaining which has impressed a lot. CyanogenMod 8 was planned for devices supporting Android 3.x codenamed Android Honeycomb, but Google on the other hand planned not to release the source code for Honeycomb and have directly announced Android 4 Ice Cream Sandwich, which seems to have some astonishing improvements and features. As Steve Kondik, one of the major pioneers behind the CyanogenMod project promised a new version in 2 months, an alpha version of CyanogenMod 9 has been released for the Ice Cream Sandwich platform. It is something many are looking forward to. There are issues that still exist that need to be addressed with the stable versions of CyanogenMod and are not meant for an average user. If you’re planning to try out CyanogenMod I recommend you do some research on the tools you’ll need to do so. You should be able to find most of them of the CyanogenMod Official Website Before you flash your phone’s OS to CyanogenMod, know that no one will be responsible for what happens to it other than yourself. You can always switch to stock ROM, but that’s guaranteed to be a big effort involved. can i use it on my Samsung galaxy pop?? Yes, you should be able to install CyanogenMod for your Samsung Galaxy pop. I did try it on the same phone as well and it works awesome. you can check here for more info on it.